In the petition, we argue that the Administrative Law Judge, whose opinion was adopted by the Secretary of State and affirmed by the Appellate Division, erred in allowing candidate Barack Obama to be placed on the ballot for the primary and general election and to run for office in New Jersey without provided any evidence to the New Jersey Secretary of State showing his identity or where he was born, when challenged to do so. We know that candidate Barack Obama was not born to “citizen” parents. His father was a British/Kenyan citizen who never became a “citizen of the United States.” Obama, even if born in Hawaii, cannot be a “natural born Citizen.” Because his father was not a U.S. citizen when Obama was born, Obama, who wants to be President and Commander in Chief of the Military, while he could have been born a “citizen of the United States” if born in Hawaii, was also born in full allegiance and citizenship of Great Britain and at age two also of Kenya. He was not born within the full and complete allegiance of the United States, an indispensable birth condition for one wanting to be President and Commander of the Military. Not being a “natural born Citizen,” he is not eligible to be elected President. See David Ramsay, A Dissertation on the Manners of Acquiring the Character and Privileges of a Citizen (1789) (citizenship “as a natural right, belongs to none but those who have been born of citizens since the 4th of July, 1776….” Id. at 6; St. George Tucker, Blackstone's Commentaries: with Notes of Reference to the Constitution and Laws of the Federal Government of the United States and of The Commonwealth of Virginia (1803) (Philadelphia: published by William Young Birch and Abraham Small; Robert Carter, Printer, 1803), http://constitution.org/tb/tb2.htm (“These civil rights [which included the right to be elected President] may be inherited, or acquired, in the United States: they are acquired by a foreigner who is naturalized; they are inherited by all whose parents, at the time of their birth, were citizens”). I will update this post as circumstances warrant. Please visit www.Article2LegalDefenseFund.com and consider making a secure donation to help cover appeal expenses for the New Jersey ballot challenge. Or you can click the Piryx donate tab. 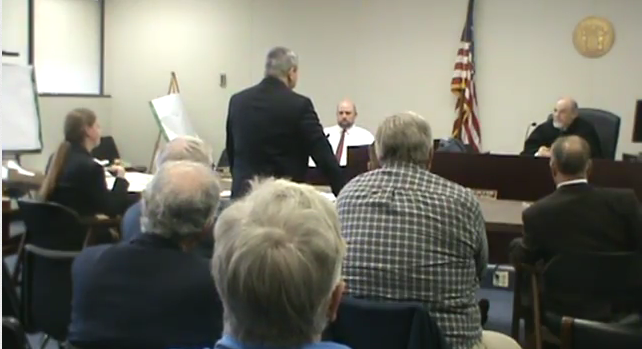 New Jersey ballot challenge hearing recorded by Daniel Haggerty of Baer Haggerty Offensive Radio. In the latest Obama eligibility challenge, an Administrative Law Judge cleared Obama for the New Jersey Democratic Primary today. The two men who objected to Obama’s nominating petition vowed to appeal. Apuzzo told CNAV during a recess in the hearing that this was the most stunning thing that any lawyer for Obama had ever admitted, in an Obama eligibility case or in any other case. When the hearing finally adjourned at 12:30 p.m., Apuzzo was confident of prevailing on this point. He observed that Hill, after objecting to everything that Apuzzo tried to introduce into evidence, offered no evidence on her own behalf and even admitted that the infamous PDF document was legally worthless. As far as I’m concerned, Obama was born in Hawaii. Apuzzo could not explain how Judge Masin could rule that way, after observing in open court that neither Obama nor his surrogates had shown that he was born in Hawaii. 1. Judge Masin ruled that Obama was born in Hawaii with no evidence on record, after acknowledging that fact during the hearing. 2. Judge Masin ruled that Obama need not comply with statute to show that he is eligible, solely because he need not “consent” to someone circulating a nominating petition for him. 3. The judge suggested that Obama might have to show eligibility later. He laid no basis for such a ruling. 4. The judge misread the precedents and gave short shrift to the historical evidence that the Framers of the Constitution defined “natural-born citizen” as one born in-country to two citizen parents. Apuzzo devoted half of his 30-page exception to this analysis alone. Apuzzo plans to appeal directly to the Appellate Division of the New Jersey Superior Court. He earlier told CNAV that he was ready to argue before the State and even United States Supreme Courts if he had to. An Article II Legal Defense Fund has been established to support legal actions to help reinstate a Constitutional Presidency, per Article II, Section 1, Clause 5. These actions may include civil or criminal complaints, lawsuits in multiple jurisdictions, including, but not limited to: direct eligibility challenges, ballot challenges, indirect suits against third parties, which would seek to clarify eligibility, or inhibit parties from supporting actions that benefit ineligible candidates and/or officials. Please visit www.Article2LegalDefenseFund.com and consider making a secure donation to help cover legal expenses for the New Jersey ballot challenge. Or you can click the Piryx donate tab.